why should he not also draw nearer to his neighbor? Although I currently reside in the United States, I was born and raised in Canada. Explorers and homesteaders were making their mark on the history of that part of the globe as early as the arrival of Viking ships upon the eastern shores, but by world standards Canada is comparatively young having only adopted its status as a Country in 1867. When I was eight years old my father presented me with two of the most glorious treasures of my Canadian past. He turned over to me a hand-written genealogy of our family tree and an old, weathered, wooden box. The family tree was written down by my father as his father lay dying from lung cancer when I was only five. Everything my Grandfather could remember about the names, dates and places of the Ives family, of Canada, was carefully recorded and now laid out before me. The primitive box, it was explained, was the personal possession of my Great Grandfather, a much beloved Captain of ships on North America's Great Lakes. The item was called a "ditty box" and acted as a nineteen century stronghold for important papers and possessions of sailing men. The ditty box, to my father's knowledge, had not been opened for more than fifty years except to add additional items to the collection inside. As Daddy called out the names and dates of previously unheard of ancestors from the family tree, I opened the ditty box and beheld a collection of perfectly preserved documents, deeds, photographs, newspaper clippings and items of seemingly ordinary importance when collected, but which had, over the years, become historical treasures. 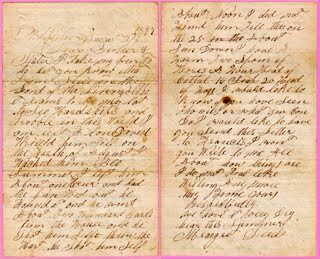 The letters, alone, from one family member to another dated as far back as 1820. It seems my Great Great Grandfather had saved every piece of paper and receipt that crossed his hands and my Great Grandfather had had the foresight to place the items, along with everything he deemed important from his time on Earth, into his seaman's chest. Five generations of day to day history, dating back to 1795, had just been handed down to me. Canada was not even a Country for another seventy-two years, yet my ancestors were living in that place. Here was the history of their lives and the land in which they lived placed into my hands for safekeeping. Thus, began my love of family history and my fascination, dedication to and electrifying excitement of historical and genealogical research. At future times I will tell more about the extraordinary contents of the ditty box as the items inside relate to other topics, but for now we have to turn our attention to YOUR family history. 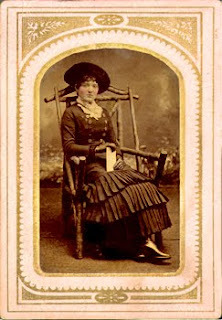 With the advent of the internet, family history research has become somewhat less of a torment. For the most part, gone are the days of driving to faraway cities and towns and sifting through dusty rooms of decaying records. It could be that an agency or association has gotten to those documents and already photographed them for public display and, hopefully, easy internet access saving you all the hard work. With the advent of the internet and email, genealogical research is much easier than it was not so long ago. Before we proceed, I simply must interject an important caution about researching your family history online. RECORD everything you discover, PROVE everything you find and never take the WRITTEN WORD as proof!! Just because someone puts a family history online does not make it absolutely true. Mistakes and errors can be made and misinformation is often plentiful. When dealing with old documents and records remember that spellings and dates were often recorded incorrectly, written phonetically or given verbally to someone who didn't have the faintest idea how to spell the word or name. Another person's version of the truth may not be your version and it is possible to find as many documents to prove both ways as it is to discover a third or fourth spelling of a name. Family histories and documents are not always correct (either intentionally or by simple error). As the saying goes, take everything with a grain of salt. 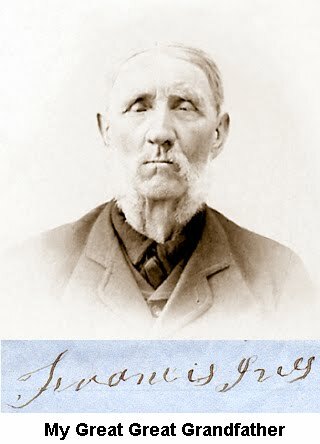 With a lifetime of genealogical research into my own family behind me and more than thirty years of restoring photographs and oil paintings and creating original portraits and storytelling paintings of the families of others, I am often consulted by clients to help with the research of their family's past. When their search dead ends the prevailing question to me is, "Where do I look now?" There are several possibilities, but here is a suggestion that very few would even consider. Head on over to the neighbors! If your family resided in the same house for some time chances are the neighborhood families were interconnected. The children played together, families attended cookouts and lazy afternoons in each other's yards and the lives of your ancestors intertwined with those of people living close by. At some point, somebody pulled out the camera and ordered everyone to, "Say Cheese". 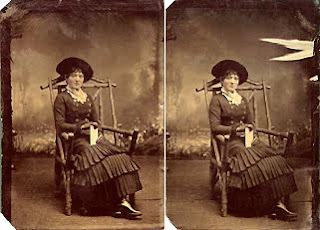 Long ago, I gave up counting how many photographs have come into the studio where the current owner of the image claims their ancestor appears in the photograph on one side or the other, but as the photograph was never labeled or identified, no one knows the identity of the other person, or persons. Someone so obviously important as to pose for a portrait intended to record their friendship for eternity is now at the mercy of my skills to airbrush them out and forever remove them from recorded history. 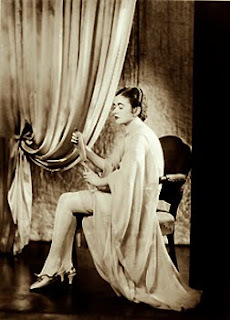 I purchased the charming photograph above from an antique dealer (something I do quite often to rescue unusual or outstanding images with which I teach or paint). 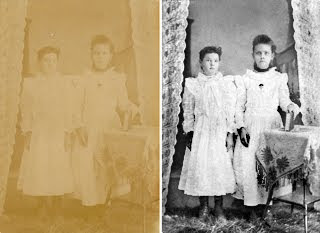 Besides the opportunity to bring to life two angelic girls as a sample of my various restoration techniques, it was the back of the photograph that created the compulsion to buy. Hand written in a shaky scrawl are the words, "Eugena Wilson and her Girl friend Juley James". BINGO!! I had found something worth more than gold. It is unknown which of the girls is Eugena and which is Juley, but there is no denying that what we have is the joining of two family histories. Not sisters, cousins or distant relations, but, perhaps, the girl next door. Did the James family live beside, behind or across the street from the Wilson's or did these little girls play together at school or in the Church grounds after the Sunday picnics? Somehow and somewhere the Wilson and James families knew each other and this photograph has captured the ancestry of members of both families. How simply tragic it feels to me when a customer requests that I remove an unknown person from their photograph. To eliminate that person and forever fade them from view seems sacrificial when some family out there in the world would give just about anything to locate this person and, perhaps for the first time, behold their face. Times have changed. We no longer depend upon our neighbors as we once did. Gone are the days when entire towns pulled together to raise a barn, tend the sick, plant each other's crops or see to it that the poor and old had food on the table or someone to visit. Today, some people never venture beyond their own property line and choose not to know even the name of the family next door let alone any details about them. Many neighbors don't offer a smile or even a consenting nod these days. When it comes to genealogical research, however, this simply will not do. Find out where your family lived, who lived next door and get to know the neighbors. Instead of asking the neighbors if you can borrow that classic cup of sugar, ask if you can take a peek at their family photographs. Is there anything written on, or included with, their pictures that would bring your family to life? 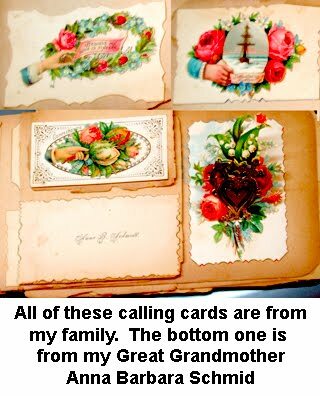 Is there anyone alive that might remember your family (good or bad), played with your family or have been a treasured friend that forever held on to that single faded photograph in their collection of memories? 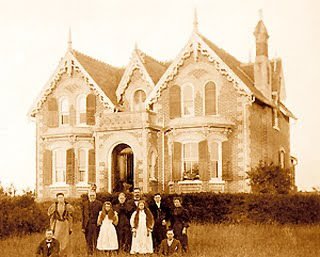 Moral of the story, the next time you are looking at the photograph of the family so proudly posed in front of the house in which they lived, maybe they only had seven children and the young one at the far left was..........the pesky kid that always hung around from next door. Family members often lived many miles apart. Friends and neighbors were often closer than family and interacted more in daily events. Sooner or later somebody got out the camera and captured the moments of ordinary people doing ordinary things. The neighbors photographed the people in their family. Those photographs just might include members of your family. Get out there and make friends with the neighbors! I have collected stacks of photographs over the years which I feel compelled to rescue from the clutches of those who wish only to profit from their sale. Many of my clients have photographs which do not contain family members and, wishing to put them in the hands of someone who will cherish them, often donate them to me because they know they will remain in loving care. I have often thought of posting these photographs online in hopes that the world my find I hold their ancestors in my hands. Hmmmmm, perhaps this should become the subject of another Blog, eh! This is an online website of unclaimed photographs in the possession of people who have no other use for the images than to see if they can be shared or returned to their rightful families. 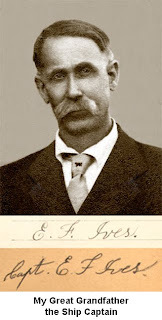 I stumbled across this site a few years ago and, to my complete amazement, found original photographs of members of my own Ives family posted right there. 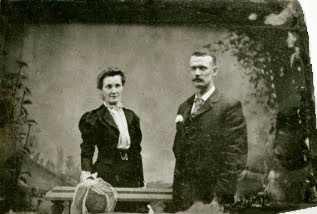 Many of the images were previously unknown and one is an original of my Great Great Grandparents in 1899, of which, only I own the only other existing copy. The website has the capability for the viewer to contact the owner of the posted photographs and negotiate contact and/or a possible trade or purchase. Just maybe, you'll have such luck as I. In the meantime, anyone descending from Eugena Wilson or her girlfriend, Juley James, PLEASE contact me immediately. I have an original photograph I will gladly return to your family album even if my family wasn't their neighbor.